Summer is here and it is time to cool off with some ice cream! Luckily, KC has a really nice selection of ice scream spots to stop by and enjoy some delicious unique treats! Taco Tuesday at Betty Rae’s – three flavors, one sauce, and topping in a waffle cone taco shell. 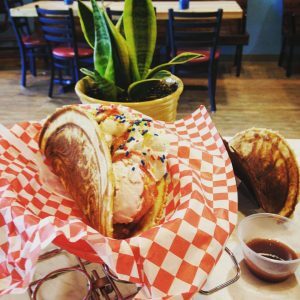 What we love: Betty Rae’s celebrates “Taco Tuesdays” with 3 flavors, sauce, and toppings wrapped in a a waffle taco shell. Brilliant! Also for the adult in us, Betty Rae’s has “Boozy Shakes” coming soon to the menu and an event on June 25th called The Float, an event at Kansas City Bier Company where there will be a collaboration on tons of unique and delicious floats with beer, cold brewed coffee from Second Best Coffee and soda from The Sundry!! With Murray’s bright and colorful store in the heart of Westport, one can’t help but be transported back in time to an old-fashioned parlor with a modern twist. With homemade flavors like Frigitte Bordeaux, Coconut Creme, Pink Grapefruit Champagne Sorbet, Grapenuts, and Batter Up!, you will keep coming back for more! Only downfall, Murray’s is closed during the winter time so get your fill this summer! 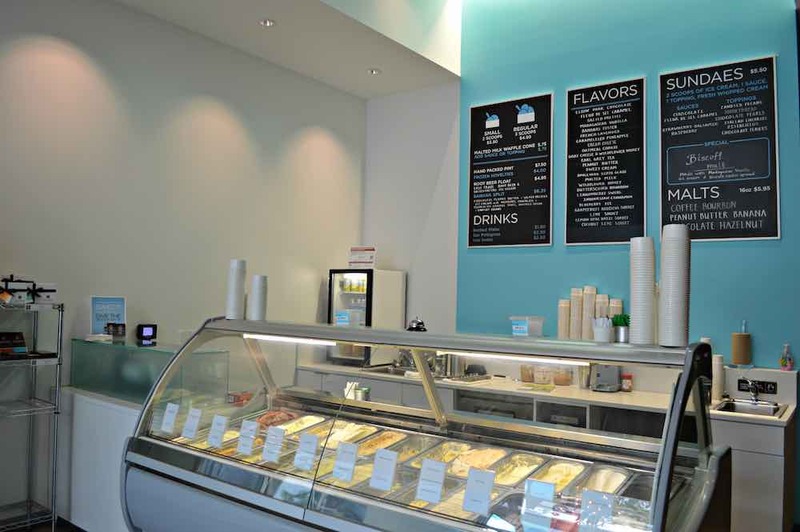 Christopher Elbow of Glace thinks one thing: “Ice cream should be pure, all natural and taste as fresh as possible. That is why Glace uses hormone-free milk and cream from cows here in Missouri to make the delicious ice cream.” His knack for wonderful ice cream is as good as his knack for chocolate. With creative and fun flavors like Mixed Berry Swirl, Root Beer, Fleur de Sel caramel (one of my faves!) and Raspberry Swirl, you are sure to find one you like! Can’t get to the store? Pick a pint up at stores like McGonigle’s Market or as a dessert at local restaurants Port Fonda and Little Freshie. 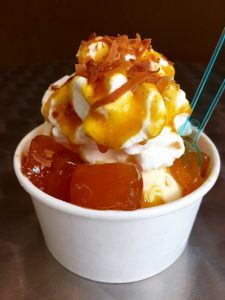 Sundae Special this week is toasted coconut ice cream, caramelized pineapple, mango rum sauce, fresh whipped cream and toasted coconut flakes! YUM! Local tip we like: Glace uses locally sourced vegetables along with fruits and herbs when possible. What we love: The Ice Cream Party in a Box! This is a delicious assortment of Glace’s pints of ice cream or sorbets, chocolate and/or caramel sauce, toppings, cups, spoons, napkins and even an ice cream scoop. Everything comes packed in a cooler with gel packs to keep it cold as it travels to a party. Located in the heart of Brookside, Foo’s is just that: FABULOUS! It is the quintessential family ice cream joint with sundaes, concretes, slurries (a delicious frozen drink,) coffee and expresso drinks- even a lunch menu for those that aren’t keen on the sweets! We are so glad that Foo’s remained in Brookside after a close call in 2014- luckily the community came together and was able to keep Foo’s doors open, showing the love for this beloved custard parlor!